You can make enchiladas verdes at home that are better than any restaurant! 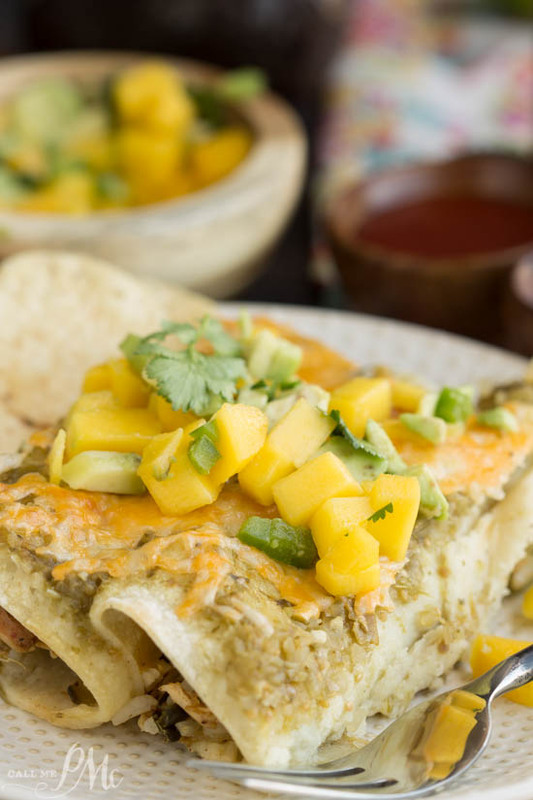 Lighter Salsa Verde Chicken Enchiladas with Avocado Mango Salsa recipe has shredded, seasoned chicken, salsa verde, cheese, and a fresh mango salsa. 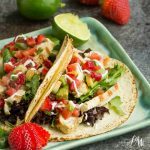 This is a delicious and simple meal that’s perfect for weeknights as well as any special occasion. 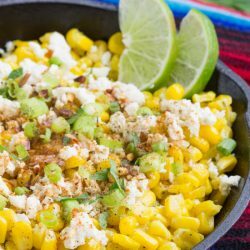 Add a little fiesta to your weeknight meal! Fast. Easy. Cheesy. Spicy. Delicious. 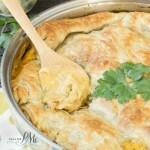 A healthy comfort food makeover! 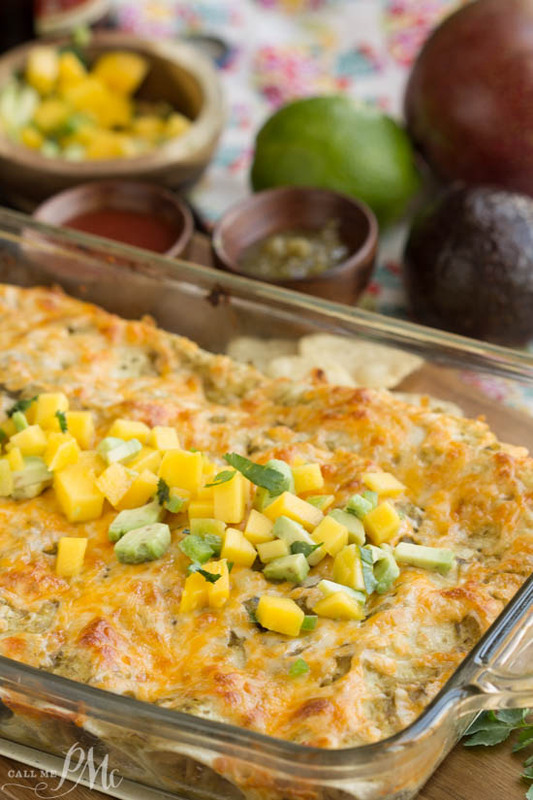 This easy salsa verde chicken enchilada casserole is everything you want in your enchiladas without the excess calories. Omit the cheese for even more fat and calorie savings! Delectable salsa verde chicken enchiladas will have you licking your plate clean. 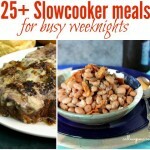 They are great for dinner and make tasty leftovers that everyone will be excited to eat. Consider serving Lighter Salsa Verde Chicken Enchiladas with Avocado Mango Salsa with Easy Mexican Rice. Quinoa can be substituted for the rice for a greater kick of protein. As mentioned above, omit the cheese for a more fat and calorie savings. Additionally, you can use corn or flour tortillas. You can make homemade salsa verde (recipe) or buy it already made. If you don’t have a mango on hand, try pineapple chunks. Fresh or canned pineapple tidbits will make a tasty fresh salsa. Check out this beautiful baking dish that goes from oven to table. Watch this video on How to Roast and Peel Poblano Peppers. You can make enchiladas with salsa verde that is better than any restaurant will serve you! 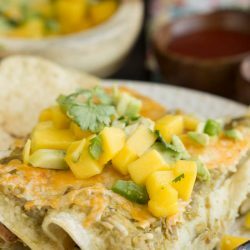 Lighter Salsa Verde Chicken Enchiladas with Avocado Mango Salsa recipe has shredded, seasoned chicken, salsa verde, cheese, and a fresh mango salsa. This is delicious and simple meal perfect for any occasion. Line a baking sheet with a silicone baking mat or aluminum foil sprayed with non-stick spray. 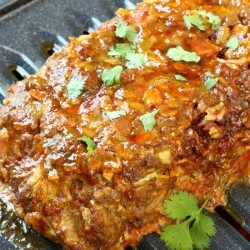 Spray or rub oil on chicken breasts then coat with cumin, chili powder, paprika, salt, and pepper. Add poblano pepper to the baking sheet. Bake for 20 to 30 minutes or until the chicken is cooked through. Pour 1/2 cup salsa verde into the bottom of a 9x13 inch baking dish. Wrap the tortillas in a damp paper towel and heat in the microwave for 30-60 seconds. Spoon a little of the chicken mixture down the center of each tortilla, carefully roll up and place seam side down in the baking dish. Repeat until chicken mixture is used. POur the remaining salsa verde over the top of the enchiladas. Top with the remaining cheese. Bake in a 350-degree oven for 20 to 30 minutes or until hot and cheese is melted. 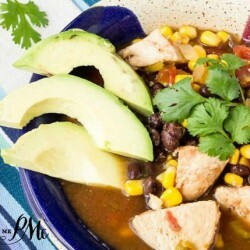 In a medium bowl, toss together avocado, mango, jalapeno, zest and juice of 1 lime, and 2 tablespoon cilantro. Store in an air-tight container in the refrigerator for up to 2 days. Sharing with friends at Weekend Potluck and Meal Plan Monday.